Dogs can be the best lifelong companions you could ever ask for. They’re not just pets; they quickly become a beloved member of your family. They’ve got as much personality as any human in your family, and all they want is your love, affection, and approval. Once you have a dog it can be hard to imagine a life without one. It’s important, however, to know how to take care of your new best friend from day one, and for new dog owners, there are important mistakes to avoid. Explore some important veterinarian’s advice for new dog owners, and learn how to keep your new four-legged family member happy and healthy for years! The first piece of veterinarian’s advice for new dog owners is to be sure you really want a canine companion. Dogs require a lot of care. They’re not as self-sufficient as cats are; they have to be walked, let out for the bathroom, and given a great deal of love and affection. They can be strong-willed and messy if they’re not properly trained. Owning a dog is a lifelong commitment. Just like people get broken hearts, if you take in a dog and decide later it’s not for you, your puppy will be devastated when you drop them off at the shelter and leave them. So, be sure you’re ready for the commitment. This cannot be stressed enough. Research the different breeds of dogs, their needs, and tendencies, and compare them with your lifestyle. Know what you can afford; you’ll have vet bills, feeding bills, bills for toys and puppy beds, grooming tools, training costs and more. Be sure that the dog you get fits your lifestyle and pocket book! Patience is key when integrating a dog into your home. If it’s a puppy, they’ll require the same kind of love, attention, and patience that any baby does. They’ll need to be potty trained (house trained), they’ll need to learn discipline, and they’ll need plenty of bonding and affection. If it’s an older dog, they’ll need time to adjust to your home. This will require time, patience and love on your part. Caring for a dog entails a lot more than a leash, collar and daily walks. It means regular vet appointments, regular feeding, obedience training, socialization, and affection. Dogs are inherently social creatures and they need to understand how their new family dynamic works. You can’t always plan for everything, so consider pet insurance to cover illnesses. Everyone has a fantasy about owning a purebred, but the truth is, there are tens of thousands of amazing animals in rescue shelters all over the country looking for their forever home, many of which may even be specific breeds. Consider a rescue animal; you’re getting a great companion and saving a pet from an uncertain fate. 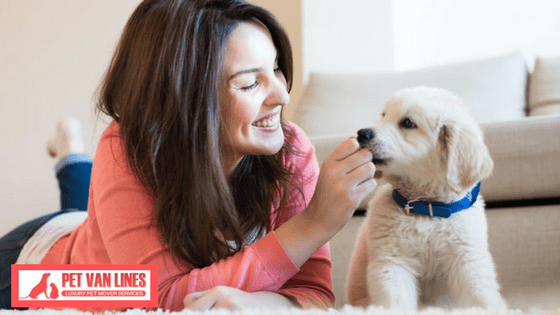 Of course, after you get your pet, you’ll need the best services when it comes time to move to a new home, and that’s where Pet Van Lines comes in. Our pet care experts are ideal to move your pet from your old home to their new digs. We care about pets and are even qualified to provide breed-specific care. Give us a call for help today!